The freeze-thaw dynamics of permafrost on the north slope of Alaska was measured over 12 years using a Global Navigation Satellite System (GNSS) site permanently embedded in the permafrost near Barrow, Alaska. The observations show average yearly subsidence of about 0.26 centimeters between 2004 and 2015. The data reveal subsidence due to thawing each summer plus interannual variations. The technique provides a new spatial and temporal approach to quantify permafrost changes and it can be applied at more than 200 GNSS sites in cold regions. Permafrost is a subsurface layer of rock or soil that is frozen for more than two years. It can be found at high latitudes and in alpine regions where temperatures remain low year round. A simplified model of permafrost includes a top active layer that experiences freezing and thawing of the interstitial water every season, a middle transition layer that experiences decadal freezing and thawing, and a permanently frozen basal layer. When water in the upper layers freezes, the volume change causes vertical uplift of the surface and when the frozen water melts, the surface subsides. The changing dynamics of permafrost, especially as underground temperatures change, is hard to measure. Understanding the dynamics of permafrost is important for understanding the water cycle, a changing climate and how changing water conditions affect the soil and the landscape. Ground-based GNSS sites have been used to measure environmental parameters by analyzing the reflected satellite signal that bounces off of the surface and into the site’s antenna. 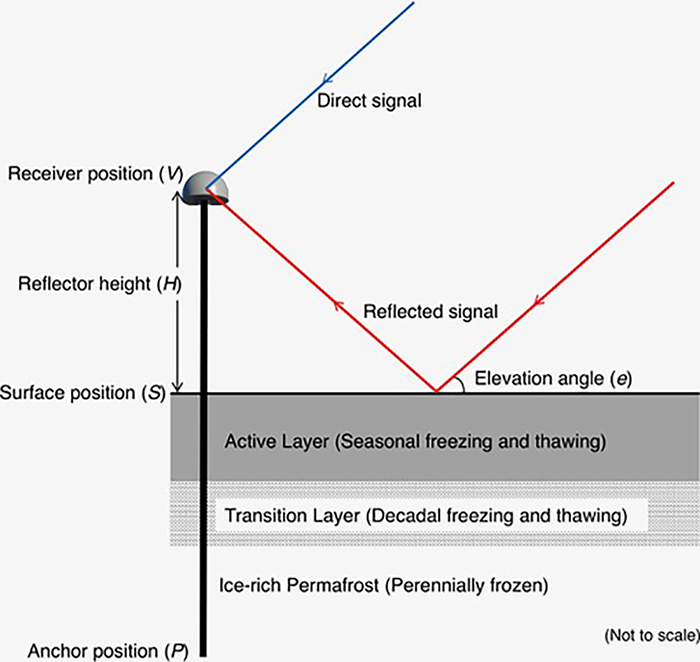 Parameters such as snow depth and soil moisture have been measured using GNSS interferometric reflectometry (GNSS-IR); essentially using the interference between the direct satellite signal and the reflected satellite signal via the signal to noise ratio. Here the researchers use GNSS-IR for site SG27, operated and maintained by UNAVCO, on the north slope of Alaska near Barrow. The GNSS antenna is mounted on a wooden monument that is about 3.8 meters above the ground surface while the bottom of the monument is about 5 meters below the surface, deeply embedded in the frozen basal layer of the permafrost. The site has been operating since 2002. The reflected signals measure the height between the ground and the antenna. The data are corrected for solid earth movement, any other surface or atmospheric noise and placed into a reference frame that allows comparison with other measurements and models. Thus the changes in the height reflect changes in the active layer and permafrost and by extracting the data, decades-worth of daily measurements can be gathered to understand the changing subsurface. The daily GNSS-IR measurements of the characteristics of the permafrost on snow-free days over about 12 years are compared to models and other methods of measuring the permafrost near Barrow. The ground surface subsided as the temperatures rose and the interstitial water melted in the transition layer on a seasonal timeframe. The GNSS-IR surface elevation changes generally agreed with GPS campaign measurements, except for three periods of heave and one month of significant subsidence measured in the campaign data. 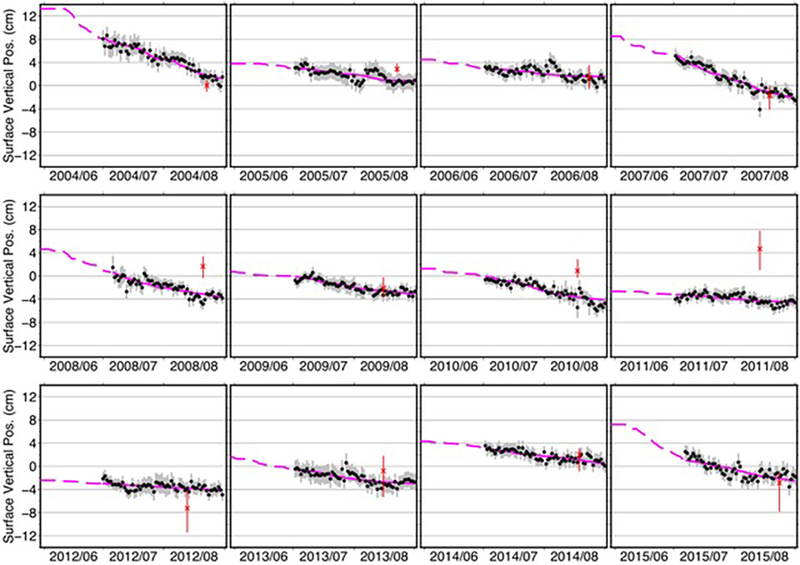 The GNSS-IR observations show subsidence between 1 July and 31 August that varies from 1.1 to 7 centimeters with a mean of 3.4 centimeters per summer over 12 years. Models showed less subsidence and the additional observed subsidence is attributed to segregated ice melting. Much more can be learned about the permafrost, especially in changing environments from the hundreds of GNSS sites and their historic and current data streams with this powerful new technique. Lin Liu and Kristine M. Larson, Decadal changes of surface elevation over permafrost area estimated using reflected GPS signals, The Cryosphere, 12, 477–489, 2018 doi:10.5194/tc-12-477-2018. Reference to additional work on this topic: Hu, Y., Liu, L., Larson, K. M., Schaefer, K. M., Zhang, J., & Yao, Y. (2018). 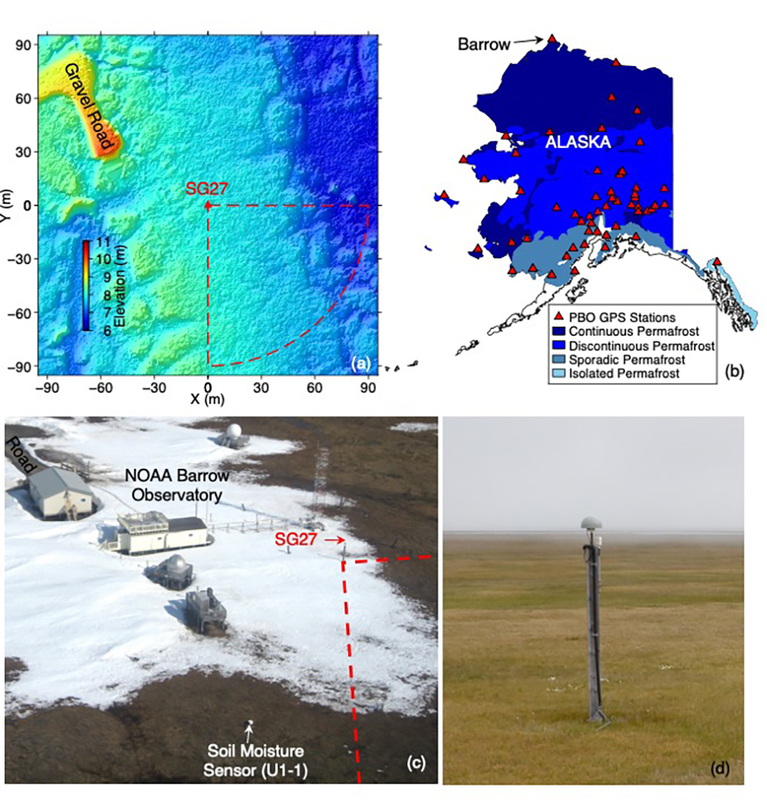 GPS interferometric reflectometry reveals cyclic elevation changes in thaw and freezing seasons in a permafrost area (Barrow, Alaska). Geophysical Research Letters, 45, 5581–5589, doi:10.1029/2018GL077960.